Popular monsters and buddies from Bushiroad�s Future Card Buddyfight X Trading Card Game will be the focus of the new Evolution & Mutation Booster Pack set, releasing on August 25. 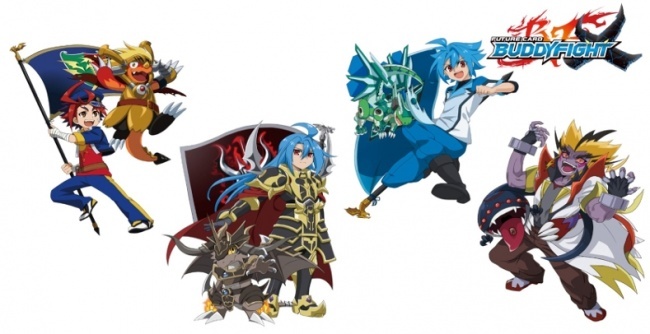 Buddies Jackknife, Yamigedo, and Drum will all appear in the new card set, with a total of seven Buddy Rares, together with cards designed to enhance the Dragon, Legend, Darkness Dragon, and Star Dragon Worlds. Evolution & Mutation will include a total of 143 cards, including reissue cards, plus an unspecified number of Secret chase cards. There will be 7 BR, 22 RRR, 24 RR, 30 R, 30 U, and 30 C rarity cards, sold in five-card packs. Each pack will have one R or higher rarity card. Some random packs will feature foil versions of common, uncommon, and rare cards. Join the fight! Preorder Future Card Buddyfight X: Evolution & Mutation (BRBFEXBT02A) now!